St. Lucia, one of Taiwan's staunchest allies, sent a new ambassador to Taiwan in May. His Excellency Edwin Laurent today paid a courtesy visit to FTV President Wang Ming-yu. During the visit, Laurent reaffirmed his confidence in the ties between Taiwan and the Eastern Caribbean island nation. He said St. Lucia was one of Taiwan's strongest allies and would NEVER bow its head to China. St. Lucia's Ambassador to Taiwan Edwin Laurent was welcomed warmly by FTV president Wang Ming-yu today during his visit to FTV’s headquarters. FTV’s president personally escorted him on guided tour. His Excellency is the first ambassador to Taiwan to visit FTV’s headquarters. Speaking on St. Lucia’s friendship with Taiwan, he expressed high confidence in the bilateral relationship. In the WTO, the World Trade Organization, we choose Taiwan instead of China. We do get a lot of pressure, but we are not going to bow under this pressure. We have been very strong in taking this position. In the face of China’s continued efforts to poach Taiwan’s allies, His Excellency said St. Lucia absolutely would not succumb to Beijing. Over many years, we’ve looked at the two systems. We have decided that if we are going to be friends with one side, then the side that we want to be friends with and the side that we will continue to be supporting is Taiwan. Back in 1997, St. Lucia broke ties with Taiwan in favor of formal links with China. 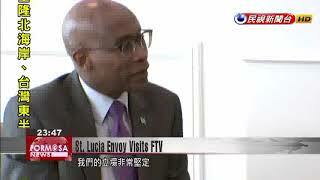 In 2007, St. Lucia restored its diplomatic relationship with Taiwan. Today the new ambassador publicly expressed St. Lucia’s support for Taiwan, saying he’s committed to further building up the bilateral relationship.